Dressed in a blue oxford shirt and neatly pressed khakis, Diego Torres-Palma looks like any other MBA student. But what sets the 26-year-old entrepreneurial engineer apart is his choice of neckwear. On this particular day, it happens to be a butterfly style, three-inch paisley silk bow tie. As cofounder of OoOTie, Boston’s only online bow tie boutique, Torres-Palma (GSM’13) is an ambassador for what has become one of the hippest accessories in men’s fashion. In 2010, he and friends Matthew Pearlson and Adrian Rodriguez (both MIT grads) set out to hatch a business. They noticed that bow ties were showing up more often in fashion magazines and on celebrities, and knew they had their product. The company launched that year with only an iPhone app and a smattering of followers on Facebook and Twitter. OoOTie sold some 600 bow ties last year, many of them custom orders for weddings and bow tie diehards. The three-year-old business is projected to sell 1,000 bow ties this year. Not bad for three men with no experience in the fashion industry. The trio dreams up the designs, hunts for fabrics at local stores, and then sends the designs to seamstresses around the world. The bow ties range from $42 to $65, and come in a variety of fabrics, including silk, cotton, wool, and corduroy, with prints ranging from polka dots to stripes to zombies to ninjas to bacon. They’ve even created a special edition tie with BU mascot Rhett the terrier. Triangle bows, popular during the 1940s and 1950s, had largely been relegated to black tie affairs in the last couple of decades. They could also be seen on stately politicians and doctors who didn’t want long ties to get in the way during exams. In short, they weren’t being worn by hip 20-somethings. But a shift started taking place several years ago, as Jay-Z, David Beckham, Robert Downey, Jr., and other trendsetters began sporting bow ties, pairing them with with shorts or jeans. Young shoppers soon took notice. Jeff Blee, the divisional merchandise manager for men’s furnishings at Brooks Brothers, says his company has seen bow tie sales increase 60 percent this year, up from 30 or 40 percent in 2011. “Bow ties are about 10 percent of our unit sales for neckwear, the rest of which is essentially flat,” Blee recently told MRketplace, a website that covers the menswear fashion industry. Other retailers report similar figures. That doesn’t surprise Torres-Palma. What began as an online-only business has expanded to bricks-and-mortar retailers nationwide, including the SoWa market in Boston’s South End, the American Museum of Natural History in New York City, and the Newseum in Washington, D.C. OoOTie was recently featured in a photo spread in Brides magazine. Women, too, have become customers, using the bow ties in their hair. 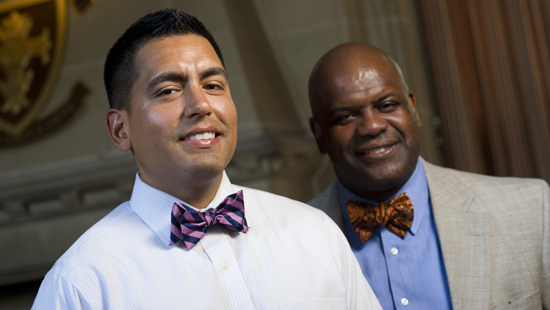 The company works hard to dispel the myth that bow ties are more difficult to tie than long ties (clip-ons are “not an option,” Torres-Palma says). 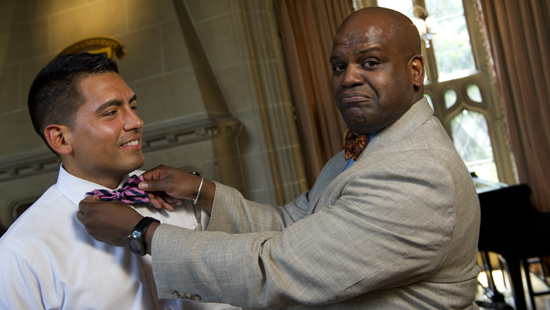 For those put off by tying a traditional bow tie, Torres-Palma suggests practicing in front of a mirror or tying one around your leg first. He says that it took him an hour and a half to learn the proper technique when he first started wearing them, but that he can now tie one in seconds. “Running OoOTie is a lot of fun,” says Torres-Palma, who also has a full-time job as a technology services manager with A/Z Corporation, a local construction firm. I love this site and the Boston U. story. My dad, a country doctor, always styled bowties, excellent blazers and tweed jackets, custom shirts from The Custom House in London, and sometimes three piece suits. I mean he went to WORK like that! He was a tall, think man, and I always believed that the bowtie drew people’s gaze up there 6 feet four inches high, to his face and made his bigness somehow friendlier for his patients. LOVE the site, love the bowties. I think we all know that the 11th Doctor is the real reason bow ties are making a comeback. Yeah, people wear bow ties now. Bow ties are cool. You would be wrong. I don’t know that. Saying “we all know” is cliche` and overused. I’m a BU grad and frequent public speaker. I love wearing a Bow Tie when I speak – and I always have loved it. Thanks for bringing the Bow Tie back… I also wear cuff links everyday – any plans to bring those back too? Or did you try that already…? Hmm, I think I am going to have to go out and buy one now.